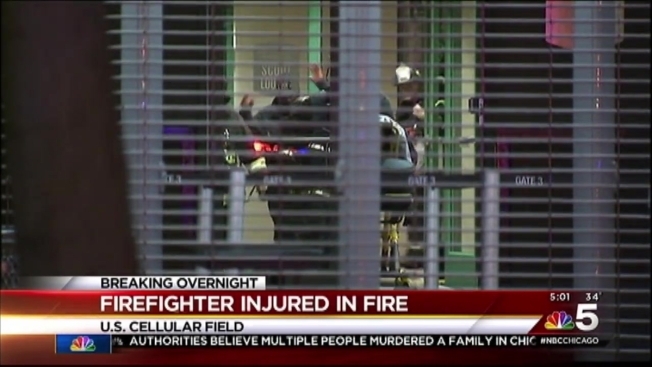 A firefighter was injured Friday morning when a small fire broke out at U.S. Cellular Field, just hours before the Chicago White Sox’s home opener. Fire crews were called to the South Side stadium just before 2:30 a.m. after a fire started in a first-floor storage room, officials said. By 3 a.m. the fire was contained by the sprinkler system. One firefighter was transported to Mercy Hospital and Medical Center to treat non-life threatening injuries, according to the Chicago White Sox's vice president of community relations Christine O'Reilly. Festivities for the team's home opener will not be impacted. "We're ready to open and ready for a ballgame today," O'Reilly said.